Daryl Alan Patterson was born on November 21, 1943, in Coalinga, California. He graduated from Coalinga High School in 1962 and entered the College of the Sequoias in Visalia, California, that fall. At 6-foot-4, he entered college intending to play basketball as a point guard, but switched to baseball after pitching for an amateur team in Melville, Saskatchewan. Since it was an amateur team, it did nothing to hurt his collegiate eligibility. After attending the College of the Sequoias, he was signed to a free-agent contract with the Los Angeles Dodgers by scout Dwight “Red” Adams. During Patterson’s years at Sequoias, the team finished with an overall record of 30–29–1 and a conference record of 20–20 under coach Roy Taylor. Aside from Patterson, Sequoias sent several other players to the major leagues, including pitchers Jack Aker and Bob Ojeda, outfielder Jim Wohlford, and former Montreal Expo Brad Mills, bench coach for the 2007 world champion Boston Red Sox. Patterson was put on the roster of the Dodgers’ Triple A farm team, the Spokane Indians, but never got the chance to pitch in the L.A. system. Patterson would not make his major league debut until he joined the roster of the Detroit Tigers in 1968 (“just in time to get a ring,” he’d say), having been selected from the Dodgers by the Tigers in the first-year minor league draft in November 1964. Before making his debut with Detroit, Patterson was part of the Toledo Mud Hens team that won the 1967 Governor’s Cup as champions of the International League, winning the best-of-seven series in five games over the Columbus Jets (affiliates of the Pittsburgh Pirates). During the regular season, the Hens finished with a record of 73–66, which was good for third place, seven games out of first. Outfielder Wayne Comer and relief pitcher John Hiller were among the Hens who joined Patterson in Detroit the next year. His major league debut came April 10, 1968, at home against the defending American League champion Red Sox. It was a two-inning mop-up relief appearance in a 7–3 Tigers loss, pitching the eighth and ninth innings. After hurling a perfect eighth, he ran into a little trouble in the ninth. He got Mike Andrews to strike out looking and Dalton Jones to ground out, but Carl Yastrzemski belted an inside-the-park home run to center field. Patterson then struck out Reggie Smith. He went 4.1 innings but did not figure in the decision in a 4–3 Tigers win. On June 5, Patterson pitched a scoreless three-inning save in relief of eventual 31-game winner Denny McLain in a 5–4 Detroit win over the Red Sox at Fenway Park. Daryl also made one start in his rookie season. In the start, which came at home August 10 against the Red Sox, he allowed all three Bosox runs on four hits, walked two, and struck out three and gave way to future star reliever John Hiller in the fifth inning. However, in a case of role reversal, it was eventual World Series hero Mickey Lolich who pitched the final 1.2 innings and picked up the victory. Patterson did have a couple of highlights against the once-mighty New York Yankees in 1968. His first came at home July 30 when he came into the game in relief of Earl Wilson, who had gone eight strong innings. Patterson pitched a perfect ninth after Wilson walked Mickey Mantle; he got Joe Pepitone to fly out to left, Rocky Colavito to line out to right, and then struck out Tom Tresh to earn his fourth save of the year as he and Wilson combined on a 5–0 whitewashing of the Bronx Bombers. His second highlight came at Yankee Stadium August 23. Patterson came into the game in the seventh inning in relief of John Wyatt, who had relieved starter Wilson—who himself had given up two runs in 5.2 innings. He was perfect in his two innings of work, even striking out Mantle to end the eighth inning. Patterson got Mantle on a 3–2 breaking ball that he called “one of the best breaking balls I ever threw in my life.” Patterson added, “Even in his final years, watching Mickey swing was like watching a stick of exploding dynamite.” However, the Tigers could not score in their half of the ninth to make a winner out of him, and Wilson was saddled with a 2–1 loss. All in all, Patterson appeared in 38 games in 1968 with one start, 22 games finished, 68 innings pitched, 27 walks, 49 strikeouts, a 2–3 record, seven saves, and an impressive 2.12 ERA. Patterson was on the roster for the 1968 World Series against the defending world champion St. Louis Cardinals. He pitched a perfect seventh inning in Game 3 at Tiger Stadium, getting Tim McCarver to pop out to third, Mike Shannon to ground out third to first, and Julian Javier to fly out to center. He was then lifted for pinch-hitter Wayne Comer. Patterson’s two-inning relief appearance in Game 4 at Tiger Stadium, however, was a bit more eventful. He came into the game in the fourth inning to replace Joe Sparma after Cardinals pitcher Bob Gibson had homered and Lou Brock had tripled. With Daryl on the hill, Curt Flood flied to right. Brock (the runner Patterson inherited) scored on a ground out by former New York Yankees slugger Roger Maris. Future Hall of Famer Orlando “Baby Bull” Cepeda then drew a walk. However, he ended the inning by being caught trying to steal second base by Tigers catcher Bill Freehan. Patterson opened the fifth inning by getting Tim McCarver to fly out to center and Mike Shannon to fly out to left. Julian Javier singled, but was erased trying to steal second when Patterson caught him leaning the wrong way and fired a dead-on pickoff throw to end the inning. Patterson was lifted for pinch-hitter Jim Price. Game 4 ended in a 10–1 Cardinals victory; but that was their last 1968 Series win as the Tigers swept the last three contest to take the Series in seven games.In his three innings of World Series work, Patterson allowed only two base runners, and both were erased trying to steal. inning stint July 11 against Cleveland at Tiger Stadium. He came into that game in the third inning and was greeted by a Ken Harrelson grand slam, but he settled down and pitched a scoreless fourth and fifth in an 8–1 Tigers loss. He also threw two innings against Baltimore on September 5 at Tiger Stadium. He pitched a scoreless eighth and ninth, allowing only a single to Paul Blair, in an 8–4 loss to the eventual American League champions. The winning pitcher that day was co-1969 Cy Young Award winner Mike Cuellar, who posted his 20th victory of the 1969 campaign. The year1970 proved to be an important one for Patterson. After being roughed up in a May 23 home game against the Washington Senators and saddled with the loss in a two-inning relief stint in which he failed to hold a 5–4 lead, he reeled off seven straight wins, all in relief. Patterson finished 1970 with a 7–1 record, 43 appearances, two saves, 55 strikeouts, and a 4.85 ERA. One of his highlights came in a September 4 game against the Senators at RFK Stadium. 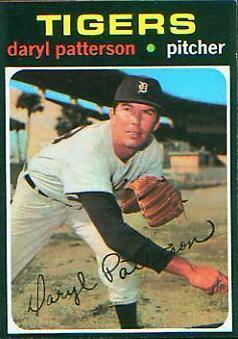 Patterson entered the game in relief of Lolich in the eighth inning. Bernie Allen, batting for Tim Cullen, opened the inning by singling to left. Darold Knowles struck out on a bunt attempt. Eddie Brinkman then flied out to center. Ed Stroud came up, batting for Patterson’s former teammate Wayne Comer, and drew a walk, sending Allen to second. Frank “The Capital Punisher” Howard singled to right, scoring Allen and sending Stroud to third. The inning ended when Stroud was caught trying to steal home. Patterson was lifted for pinch-hitter Ike Brown during a four-run Tigers rally in the top of the ninth to take a 6–3 lead. Tom Timmerman then pitched the ninth and picked up his 24th save, ensuring Patterson’s seventh win of the 1970 campaign. Patterson started off the 1971 season on the Tigers’ roster. He got into 12 games and posted a 0–1 record with a 4.82 ERA. He was traded May 22 to the Oakland Athletics in exchange for infielder John Donaldson. Patterson got into only four games with the eventual AL West champs, posting no record and a 7.94 ERA before being sold June 25 to the St. Louis Cardinals. Patterson made two starts with the Cardinals in 1971. In his second start, he achieved a somewhat dubious honor. Bob Gibson had been taken out of the rotation once the Cardinals fell out of the 1971 National League East race. This meant that Patterson would be the starter (and loser—in his only Redbirds decision of the year) in a September 30 game against the Mets at Shea Stadium. The winning pitcher in that game was Tom Seaver; with the win, Seaver posted the second of his five career 20-win seasons en route to 311 career wins. Patterson went 5.1 innings with five runs, four hits, four walks and one strikeout. Among the hits were two home runs to Ken Singleton. Incredibly enough, Patterson had retired the first 14 batters he faced before the Mets’ bats came alive. It wasn’t the first Patterson-vs.-Seaver confrontation; they had pitched against each other when they played junior college ball in California. Seaver pitched for Fresno City College before transferring to the University of Southern California. Patterson recalled his time in St. Louis as being “very enjoyable” and the fans as being “very knowledgeable.” His locker was right next to Gibson’s. He had very fond memories of Gibson: “He was very tough to get along with, but he liked me,” Patterson said. On October 21, though, Patterson was returned to the Athletics. Patterson played winter ball for Ponce in Puerto Rico in the 1971–1972 off-season and pitched a shutout against Mexico February 7, 1972, to win the Caribbean World Series. That spring, he reported to the Oakland A’s minor league club in Tulsa, Oklahoma. In 1973, Patterson was sold by the A’s to the Pittsburgh Pirates. He spent the season pitching for the Pirates’ top farm club, the Charleston Charlies, in Charleston, West Virginia. The Charlies were managed by Joe Morgan, who managed the Boston Red Sox in the late 1980s and early 1990s. Among his teammates were: Frank Tavares and Omar Moreno, who played key roles on the Pirates’ 1979 world championship team, and future big-league player and manager Art Howe. The Charlies finished the 1973 International League regular season in first place. However, they lost the Governor’s Cup finals to the Pawtucket Red Sox. After retiring from baseball after the 1974 season, Patterson went to work for Pacific Gas & Electric. In twenty years with the company, he rose from helper to chief inspector. One of his major projects was a $7 billion hydroelectric job. In 2007, Patterson was reunited with some of his 1967 Toledo Mud Hens teammates when the Mud Hens hosted a reunion of the 1967 Governor’s Cup championship team. Today, he makes his home in Clovis, California. Gillette, Gary, and Pete Palmer, eds. The ESPN Baseball Encyclopedia, 2007 edition. New York. Barnes and Noble Books. 2006. Bena, Parker. Interview with Daryl Patterson. September 21, 2007.